I Have Both Credit Card and Student Loan Debt. Which Should I Pay First? If you’re a recent college graduate who’s dealing with a pile of student loan and credit card debt, you’re not alone. 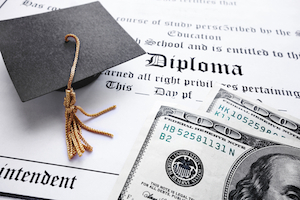 According to a 2013 report from CNN Money, the average graduate that year left school $35,200 in the red. That’s no small sum, so it’s important to make a plan before tackling this type of debt load. Step one? Deciding which to pay off first, student loans or credit cards. If you’re not sure, take a look at the details below – the Nerds have some important advice that you need to hear. Before discussing whether it’s best to prioritize repaying credit cards or student loans, it’s important to remember that staying current on both debts is essential. Even though you’ll be devoting extra time and money to paying one of these accounts off as fast as possible, making at least the minimums on both by their due dates is critical. Here’s why: Building and maintaining a good credit score depends on paying your bills on time. A whopping 35% of your FICO score comes from your payment history, and the only way to get high marks in that category is by paying at least the minimum on all your bills by the date they’re due. And remember, a good credit score is essential to getting competitive rates on loans and insurance policies, and will also be checked when it’s time to rent your first apartment. Doing everything you can to keep it in good shape is a smart move. Almost without exception, it’s better to devote your extra funds to paying off your credit cards as opposed to student loans. Mainly, this boils down to a big difference in the interest rate you’re likely carrying on each type of debt. As of September 2014, the average credit card interest rate is hovering around 15%. In contrast, most student loans charge interest rates in the single digits – for instance, undergraduate Stafford Loans carry a rate of only 4.66% for the 2014-2015 school year. By focusing on paying off your credit cards before your student loans, you’re likely saving yourself a boatload in interest payments over the long run. But there’s also your credit score to consider. Thirty percent of your FICO score is determined by amounts owed, and a factor that heavily influences this category is a number known as your credit utilization ratio. Your credit utilization ratio is calculated by comparing the amount you owe on your credit cards to your total credit limit. In general, it’s best to keep it below 30%. However, your student loan debt isn’t counted as part of your credit utilization ratio. This is because student loans are installment loans, and only revolving credit balances affect this calculation. As a result, even a very high student loan burden won’t directly do damage to your credit score, but a high balance on your credit cards will. So by making an effort to bring your credit card balance down, you’ll probably see a jump in your credit score. This, in turn, will make obtaining other types of credit cheaper. Talk about a win-win! Make a detailed budget that devotes a lot of your monthly income to debt repayment. Stop using your cards for the time being. It’s tough to pay off debt if you’re adding more to it! If you have debt on multiple cards, figure out which one has the highest interest rate and focus on paying it off first. Then attack the card with the next highest interest rate, and so on. This will help you save the most money on interest payments. Consider refinancing your debt with a personal loan or transferring your balance to a 0% card. Think about ways to earn extra income, then throw the extra cash at your debt. The takeaway: If you’re swimming in credit card and student loan debt, it makes the most financial sense to focus on paying off your credit cards first. But be sure to stay current on your student loans, and use the Nerds’ tips above to eliminate the balance on your plastic as fast as you can.